One of my favorite baking books is “The Modern Baker” by Nick Malgieri. I like this book because it shows you methods of baking with all different types of doughs and how to make different icings. I’m not a huge fan of lemon desserts, but this one looked really good. 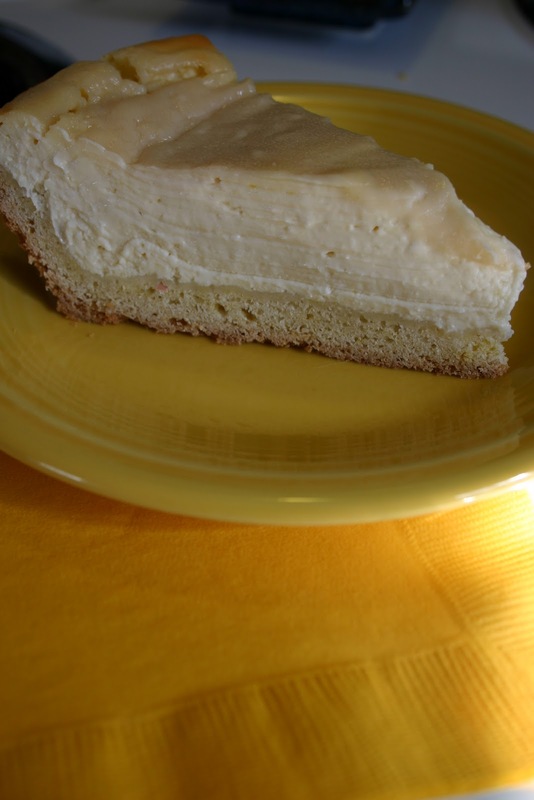 It’s cold outside right now, so I think a lemon dessert might help with my dream of summer. This is a different dessert, so I think at a potluck it would stand out. Garnish with lemon zest or thin slivers of lemon peel and I think people will know it’s lemon. Whisk flour, salt and baking powder together. Cut the cold butter into 8 pieces and add to mixture. Pinch the butter into the flour until it is all broken up and mixed in. Add in the sugar and one egg, mix. Then add other egg, mix. Keep folding it over until it begins to stick together enough to take out and form a ball. Because of the sugar content, the dough can be kneaded about 15 times to make it form nicely. 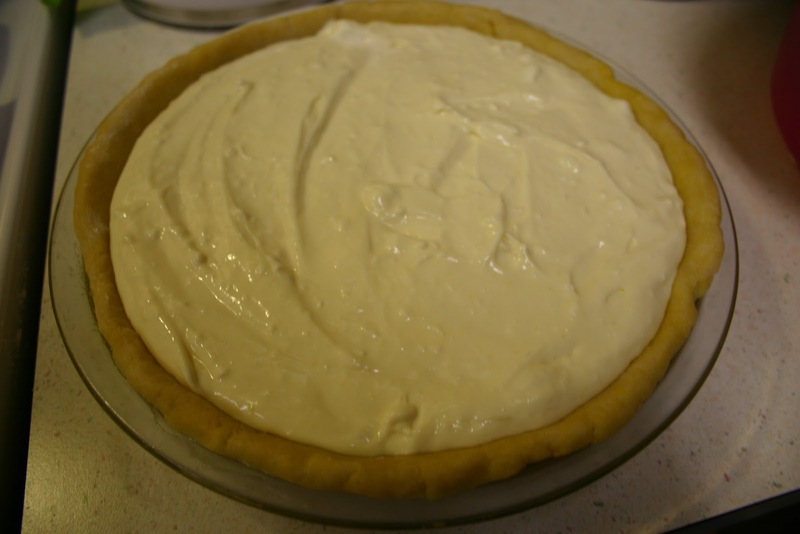 Roll out into a circle 1″ larger than the pie/tart pan, about 1/2″ thick. Roll mostly from the center out with each pass, trying not to touch the edges too much. Grease the pan and lay dough over, then form the edge to look nice. The cream cheese will need to be at room temperature. It will take a few hours to do so. Add cream cheese to mixing bowl with sugar until soft and blended. Add vanilla and lemon zest, mix. Add one egg at a time, mixing after each one. 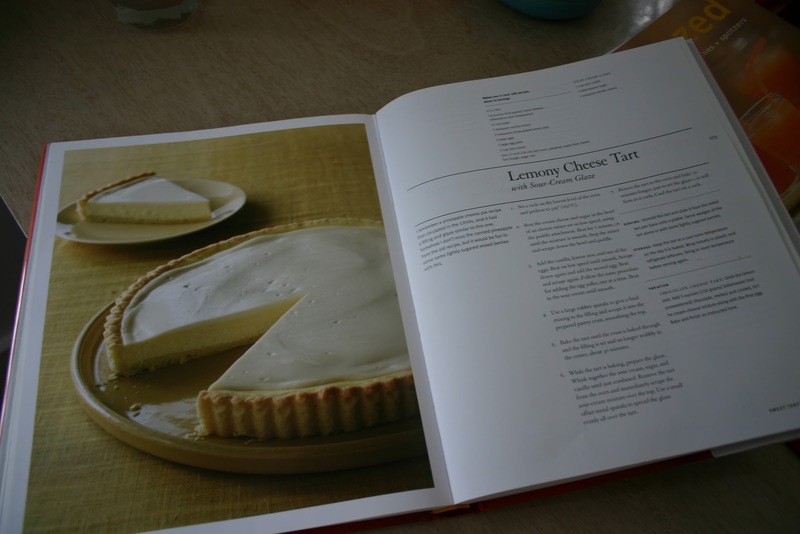 Fill tart/pie pan with the lemon filling. Set oven rack on the lowest position and pre-heat oven at 325 degrees. Bake 30 minutes. While the tart is cooking, make the glaze. After the tart has cooked 30 minutes, add the glaze on top and cook an additional 10 minutes. Garnish with thin lemon slices or zest. If you are using a pie pan (like I did), cook longer (mine took an additional 20 minutes because the pie pan makes the dessert thicker than a tart pan.) It may still ‘wiggle’ but it will set once it cools. Don’t worry if the lemon filling looks like it is going to spill over, it will lower and set once it has cooled too. I figured mine was done once the lemon filling was beginning to brown and crack at the top edge.